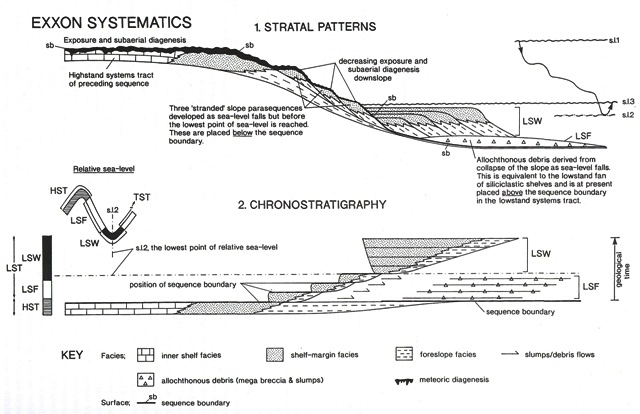 A further contradiction of Stenon’s principles of stratigraphy can be seen in sequence stratigraphy, for instance, by examining the EXXON SYSTEMATICS diagrams (Stranded parasequences and the forced regressive wedge systems tract : deposition during base-level fall , Hunt & Tucker – 1992, Sediment. Geol., 81:1-9). In the upper diagram 1. STRATAL PATTERNS, LSW consist of two superposed facies (shelf margin and foreslope facies). In the lower diagram 2. CHRONOSTRATIGRAPHY, each of the five horizontal lines in LSW, which are isochrones relating to the vertical geological time scale on the right of the diagram, and correspond to the five positions of the slope in the upper diagram, cut across the two facies. This indicates a simultaneous deposition of the two facies, which is in contradiction to Steno’s principle of superposition, when the lowest stratum formed, none of the superior strata existed, here applied to superposed facies. Apart from sedimentology, there are two other important subjects which I think are relevent. The second concerns radiometric dating. Brent Dalrymple, a leading specialist in K/Ar dating has given examples of several volcanoes where the year of eruption is historically known and where the K/Ar dating is completely divergent. according to the model age equation. The report says “these ages, of course, are preposterous. The fundamental dating assumption (no radiogenic argon was present when the rock formed) is questioned by these data. Instead data from the Mt. St. Helens dacite, argue that significant “excess argon” was present when the lava solidified in 1986. Phenocrysts of orthopyroxene, hornblende and plagioclase, are interpreted to have occluded argon within their mineral structure deep in the magma chamber and to have retained the argon after emplacement and solidification of the dacite. Orthopyroxene retains the most argon, followed by hornblende, and finally plagioclase”. The presence of abundant argon deep in the rocks produced at the time of the eruption (recent or ancient) and which rises towards the surface of the magma, gives the impression the rocks are older than they are when dated by the potassium/argon method. The fact that the method has been used to date the Australopithecines raises the question: what then is their real age? This fundamental dating assumption, as regards other radiometric dating is also questioned, because every sample rock contains a quantity of daughter resulting from the decay of the parent in the lava, before crystallisation, which makes the rock appear older. The model age equation requires that the initial number of daughter atoms be known. No analytical equipment, however, can give this value. The isochron age equation depends on several assumptions, the principal being that rocks of a same formation, when they formed, had the same abundance of daughter, in this case argon. This is not so for the dacite and its components mentioned above which only ten years after the eruption showed different respective quantities of argon. The model age so determined corresponds to magma and not crystallisation (as for the dacite). Moreover, gravitational settling between minerals exists in the cooling magma. For example, strontium, which has the same valence and very similar ionic radius substitutes for calcium. So in fact, since plagioclase which carries strontium is less dense than olivine, then due to gravitational settling in an intrusion the greatest quantity of plagioclase and therefore strontium can sometimes remain in the higher levels of that intrusion. So strontium can be more abundant at a higher level in a magma intrusion which gives an apparently older age. In conclusion the radioactive age does not necessarily refer to the crystallisation of rocks and consequently not to geological dating. Copyright © 2016 Sedimentology. All Rights Reserved.